Minimally Invasive Spine Surgery - Matthew D. Hepler, M.D. Minimally invasive spine surgery (MISS) is a surgical technique that uses small surgical incisions for visualization and treatment of various spine conditions. MISS, similar to the introduction of hip and knee arthroscopy, decreases soft tissue exposure and dissection and theoretically decreases infection rates and recovery time. These techniques may include the use of small video cameras, endoscopes, lasers and special instruments through small incisions (less than 2 cm) in the chest, abdomen, and spine to perform the necessary surgery. Figure 1. 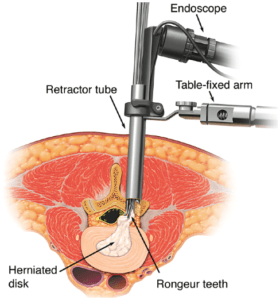 Illustration of microdiscectomy through a minimally invasive endoscopic tubular retractor. 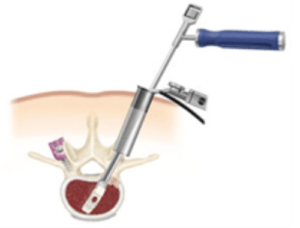 These laparoscopic and endoscopic techniques have gradually developed over the last several decades; they were initially introduced for diagnosis and then later for treatment of certain spine conditions. They follow similar advances in orthopaedic surgery with joint arthroscopy and general surgery with laparoscopy. They are now used to treat degenerative conditions (including disc herniations and stenosis), trauma (including spondylolysis, compression fractures and burst spine fractures), and some deformity conditions including spondylolisthesis and scoliosis. Not every patient is a candidate for a minimally invasive approach for spine surgery. To determine if this might be the best option you will need a detailed evaluation with a thoroughly trained and experienced spine surgeon familiar with these techniques. Dr. Hepler, a spine surgeon in Ft Lauderdale and Delray Beach, has been a leader in this field and instrumental in advancing some of these techniques over the last 17 years. MISS has been used successfully for a range of degenerative, traumatic and deformity related conditions. This includes surgical repair of disc herniations of the lumbar, thoracic, or cervical spine and some cases of stenosis. These have been treated with both endoscopic techniques which involve direct visualization of the pathology and indirect visualization through the use of a small endoscopic camera. Similarly, MISS has been used to treat some fractures including the surgical repair of spondylolysis, repair and stabilization of compression fractures, and some spine fusions including scoliosis correction. Figure 2. A spondylolysis repair performed on a division I college football player using MISS techniques with solid healing on fracture seen on postop CT.
Minimally invasive spine surgery has several advantages over traditional open approaches to the spine. First, the smaller incisions require less soft tissue dissection; this results in less blood loss, reduced post operative pain and faster healing and recovery. The smaller approach also is less prone to infection. What are the risks to MISS? As with any surgical procedure there are inherent general and procedure specific risks with MISS. General surgical risks include medical complications such as pneumonia, urinary tract infections, allergic reactions, myocardial infarction (MI), renal failure, deep vein thrombosis which may break off and travel to the lungs (pulmonary emboli), cerebral vascular injury (stroke) including blindness, and blood loss requiring a transfusion. Preoperative evaluation with your primary medical doctor is often necessary to identify and treat any risk factors, optimize the medical condition, and determine suitability for surgery. Procedure specific risks include post operative infection, dural tear, nerve injury (even spinal cord injury in very rare cases), non union, instrumentation failure, and need for revision surgery including conversion to an open procedure. Figure 3. Illustration demonstration interbody fusion (TLIF) using MIS technique. How do I determine if Minimally Invasive Spine Surgery is right for me? Not every patient is a candidate for a minimally invasive approach for spine surgery. To determine if this might be the best option you will need a detailed evaluation with a thoroughly trained and experienced spine surgeon familiar with these techniques. Dr. Hepler, adult and pediatric spine surgeon in Delray Beach and Fort Lauderdale, has been a leader in this field and instrumental in advancing some of these techniques over the last 17 years. Of course the decision to undergo minimally invasive spine surgery should be a carefully thought out process made after appropriate non-operative treatment has failed to resolve your spine condition.